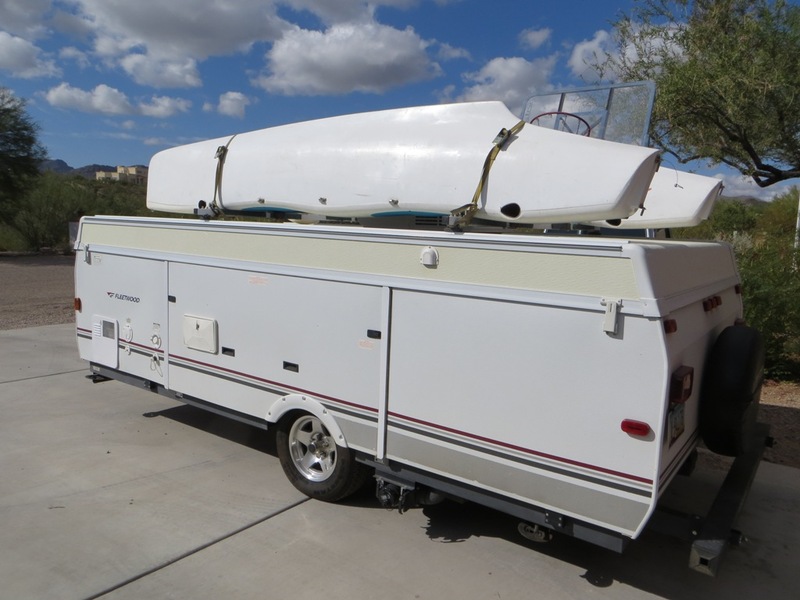 We've had various pop ups over the years and we like to take our sailboat with us when we go to the water, so I've always fabricated a roof rack of sorts to carry our Hobie Wave. With the old tent trailers I've just drilled holes in the roof and bolted my home made rack in place, being careful to seal everything up really well. 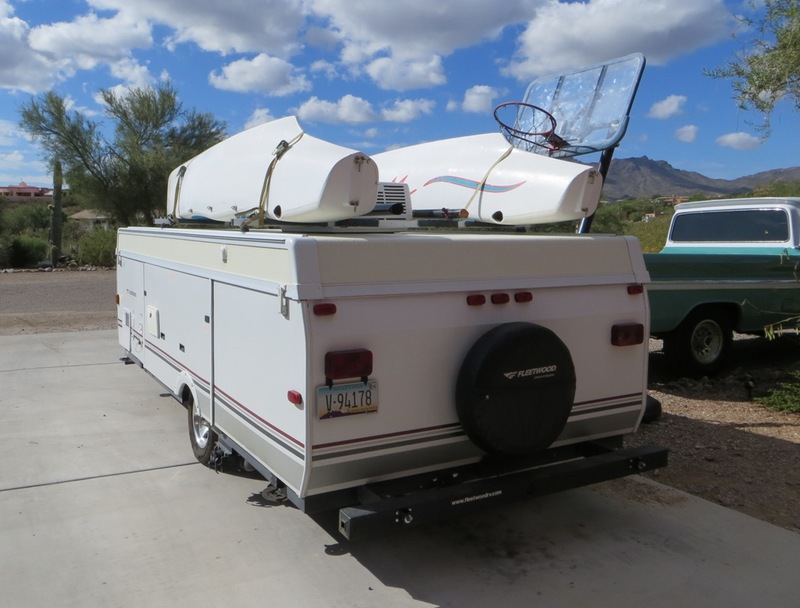 Our newest tent trailer is a 2007 Fleetwood Niagara. One of it's features is a roof rail that is designed to accommodate a roof rack without drilling any holes in the roof!! A very nice feature but the racks can be rather pricey. I'm used to spending 20 or 30 bucks on some materials and making a suitable rack. The following illustrates at least one way to fabricate a great rack for much, much less that the ones that are available on the market. Thule, the company that is famous for making all kinds of racks for carrying bicycles, etc., makes a system that is designed to attach to the factory roof racks of various SUVs. The system consists of "blocks" that slide into the grooves on the upper roof rack rails with cross members that attach to them. The block are relatively inexpensive but the parts that allow you to click the cross members in place get crazy expensive. I purchased a set of the blocks on ebay for a reasonable price. Thule makes several configurations since the grooves in factory roof racks vary from SUV to SUV. The one that fits the Niagara is the Thule Tracker II, TK1. They come four to a set which is what you'll need. They come with special nuts that slide into the grooves on the trailer and rotate into the slots in the grooves when tightened. I purchased a 20-foot stick of 1-1/2" thin-wall square tubing (it cost less than $20), 4 ea. U-bolts (these happen to be for 1-1/2 dia. tubing), and some other odds and ends at my local hardware store. The U-bolts slip into the Thule block as shown here. I cut the square tubing in 84" lengths. Mount the blocks onto the trailer and set the square tubing in place and carefully mark where the centers of the blocks fall. This will allow you to drill the holes for the U-bolts in the right place. The holes in the bottom of the tubing will have be to slotted a little to allow the curve of the U-bolts to go up into the tubing. Otherwise the U-bolt will not tighten against the steel pin the Thule block. I cut the U-bolts off to a suitable length and installed acorn nuts on the ends and added plastic end caps to give a finished look. My rack is for a specific purpose so I installed some hooks in the proper location to tie down the catamaran. Click on either of these photos to see the Hobie Wave in place on the rack.